Last week, we engaged the Nutritional Aesthetics® community in a discussion about the newly released American Academy of Dermatology guidelines for the treatment of acne. At the NAA, we were also debating the guidelines, which fail to include some of the many successful, integrative approaches to this common skin condition. In our biweekly newsletter, we expressed our disappointment that the new guidelines appear to overlook the presence of the skin microbiome, as well as existing evidence that there are both alternative topical treatments and science-backed dietary links to acne. As we expected, the NAA community also had a lot to say on this topic! We asked readers what they thought about the AAD’s new guidelines—in particular if they, like us, were hoping to see a more integrative approach advocated. We received a number of affirmative responses that, yes, more attention to integrative skin health was hoped for in these guidelines, if not expected in light of all the recent scientific breakthroughs that provide solid evidence of alternative treatment options for acne. However, you told us that you were not surprised by the guidelines. In addition to the response from Dr. Georgia Tetlow featured in our newsletter, NAA Advisory Board member, Dr, Trevor Cates, ND also agreed that there is ample evidence of the effectiveness of both alternative treatments and dietary modifications in improving acne. She shared this article, which is an excellent review of the current scientific literature on this subject. One reader thoughtfully suggested that we “consider the difference between what a naturopathic doctor and a western doctor would prescribe, and acknowledge that this is perhaps a similar contrast to NAA and the American Academy of Dermatology.” We agree with this point, and believe this is something consider on a regular basis. Indeed, we considered this difference particularly when we wrote our mission statement and decided to formally acknowledge the skin-health link as the new field of practice that is Nutritional Aesthetics®. We believe that it’s imperative that a company whose mission is to define and advance a field of practice be self-aware enough to recognize its home on the spectrum of skin health, and be able to articulate that home to those that seek its shelter. We decided from the beginning that Nutritional Aesthetics® is an integrative approach to healthy skin, one that encompasses the holistic, alternative, as well as Western and scientific approaches when necessary. 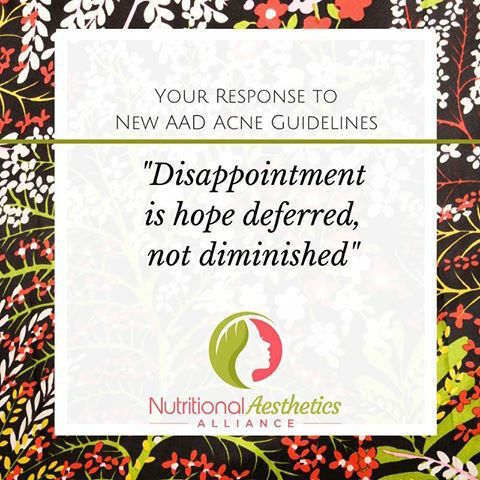 “Instead of being disappointed in [the AAD’s] approach,” she continued, “perhaps acknowledging that they are remaining constant in their beliefs and highlighting how NAA is a contrasting approach (and also scientifically supported as you mentioned) would leave a positive message for subscribers versus simply a disappointed feeling that change still hasn’t come.” While we acknowledge this excellent point, we feel that disappointment is hope deferred, not diminished. Experiencing these feelings of disappointment gives us valuable information about our hopes for our audience and serves to galvanize the NAA’s efforts and steel our resolve. And trust us, we are up to that challenge! As we expressed in our newsletter, “certainly it takes considerable focus and sustained conscientious action to change our approach to a skin condition as widespread as acne, and even longer to change the overall societal consciousness of the skin-health link.” We know that this shift won’t happen overnight, but it may happen over the course of several years. Not only are we certain that we’re witnessing a gradual shift in the treatment of and consciousness about our skin, we love the existence of a vocal, engaged community that is a part of this movement, and continues to push forward the future of skin health with its passionate interest and devoted work. We thank you for so openly sharing your opinions on our newsletter. 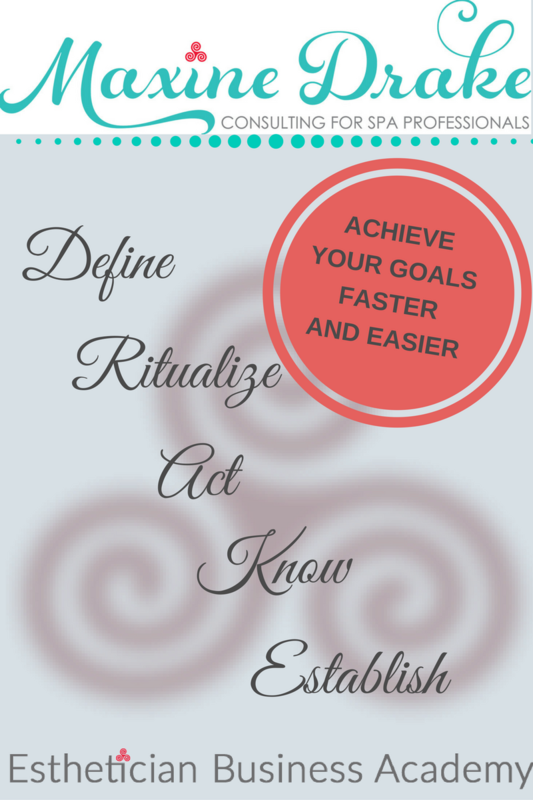 If you haven’t shared yet, please do so below! What do you think about the new acne guidelines, as well as their implications that there isn’t sufficient evidence to support a change in diet or for the use of alternative treatments for acne? Please leave us a comment below and share your thoughts. Are you part of our email community yet? 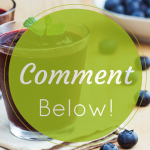 Our email newsletters contain trending social media topics in Nutritional Aesthetics®, as well as thought provoking discussions and opportunities to get involved like the one that inspired today’s post. All you need to do to join our email community is click here to sign up for our Integrative Guide to Healthy Skin–you’ll get the guide and then start receiving our biweekly emails.